35 km Sputh of Cuernavaca. through roadway 95 or highway México DF - Acapulco until Alpuyeca. Continuing in direction Miacatlán until km 8, turn in direction Xochicalco (4 km). 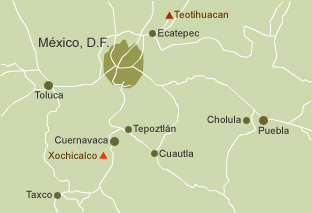 The fortified city of Xochicalco was built some time after the decline of Teotihuacan (100 B.C. 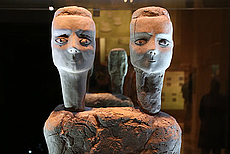 - 650 A.D.) Although its heyday only extended between 700 and 900 A.D., Xochicalco is considered as the most important center of the late classical period of the central Mexican high plateau, due to its splendor and cultural development. The ethnic origin of the inhabitants is not known. The city ended destroyed, burnt down, and abruptly abandoned around the 900 A.D. In the 16th century, the Franciscan monk Bernardino de Sahagún refers in his texts to a building near Cuauhnáhuac (Cuernavaca) with the name of Xochicalco, but this does not mean that the place itself had that name. The word in Nahuatl is composed of xóchi(tl) = flower, cal(li) = house and the locative -co, what would mean "in the house of the flowers". However, in the archeological site a glyph was found which could be considered as indicator of the name of the place. A figure of a stair encloses a turkey's head, from which it was concluded that the original name of the place could have been Totolhuacalco: "where birds are trapped". 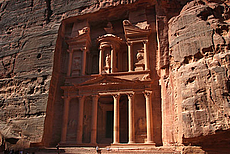 The city was erected according to a complex plan on top of an elevation of about 130 m with a maximum extension of 4 km. During that time it must have been the most populated locality in Central America. Through terraces, walls, fortifications, and platforms, the builders achieved to give the hill itself the shape of a pyramid. There was also an ingenious drainage system, numerous cisterns for water storage, and large silos for corn and other provisions. 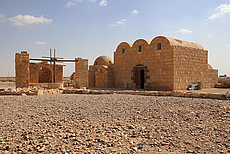 The most luxurious residential areas and religious centers where located at the upper part of the site, and they probably had a restricted access. The more modest housing was on the lower terraces, what accounts for a strict social division. Alike other places in Mesoamerica, two main deities were worshiped in Xochicalco: the one of the earth and the one of the water and wind. Their original names are not known, but it is clear that they correspond to gods who later on were denominated Feathered Serpent and Tlaloc. The most revered god was Tlaloc. His ceremonies took place on the largest squares and on the most important pyramids. The Feathered Serpent was probably a deity of the elite, since most of its representations and sanctuaries where in the upper part of the city. A great number of the monuments and sculptures that remained at the end of Xochicalco, were covered with stucco, to erase the former references. A new divinity appeard as well, represented as a figure emerging from the jaws of a feathered serpent, who later would become Quetzalcóatl, the wise god, transmitter of culture, and who sacrificed himself for humanity. 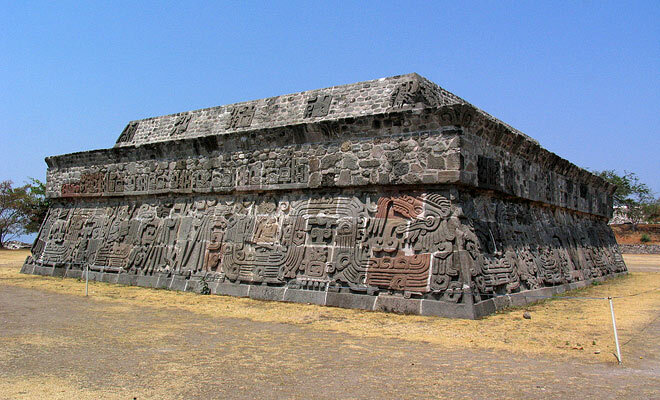 Xochicalco is mainly known for its Pyramid of the Feathered Serpent, the emblematic building of this archeological site. More about, on the image pages. © Copyright: All the texts, translations and photos are protected by copyright. Any further use requires explicit permission.